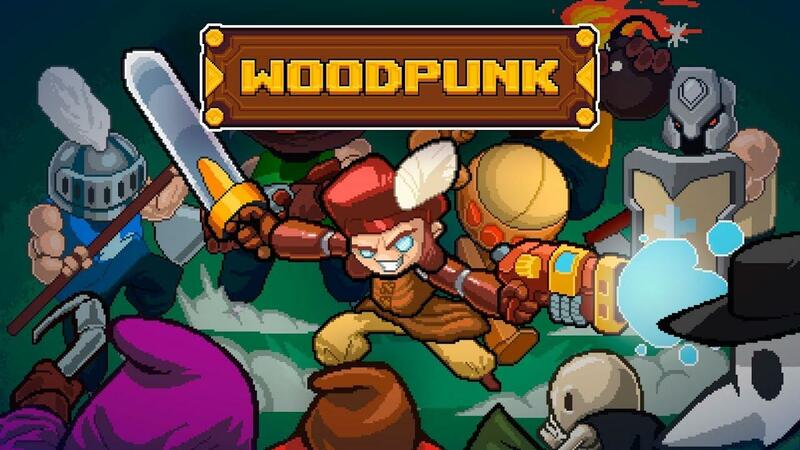 I did briefly mention Woodpunk in a previous article when it was supposed to release but they hit some sort of snag with their Publisher. The developer, Meteorbyte Studios, has since sent over a copy and I've actually had a lot of fun with this one. It's actually pretty different to games like Nuclear Throne and Enter the Gungeon, while taking inspiration from them it's firmly a unique game. Gave me quite a lot of laughs too, especially the way you could spear enemies and then launch them across the screen. The way you get new weapons is a little odd and random, as you take down enemies you collect scrap and eventually when you have enough your little companion is ready to spit out a new weapon. You never know exactly what it will be and it's not always terribly useful. Weapons break after a while though, so you will need to use whatever they make you. When you die, you do get to keep your collected scrap to go through the upgrades tree to have more variation in the types of weapons your little friend will make for you. There's some ridiculous stuff in there too! Roguelike Pixel Shooter with endless variations of level designs. Procedurally generated weapons, both melee and ranged. Over a hundred simultaneous enemies on screen, with individual A.I. and strategies. Huge tech tree to create and enhance your weapons arsenal. One feature I'm particularly happy about seeing as an option, is the ability to have a "sticky trigger". This allows you to just hold down the mouse button to shoot with non-automatic weapons. For such a shooter, where you often end up with tons of enemies repeatedly tapping the mouse felt a little awkward. This was added in as a result of feedback too, so it's good to know the developer listens. I did notice a few times it slowed down a bit, particularly when tons of enemies are on the screen so hopefully they will continue to optimize the performance. If you enjoy shooters and bullet hell games, you will probably enjoy this. It's certainly difficult though, especially early-on when you don't really have access to much but worth pushing through to play with all the cool stuff you can unlock.